Auckland Libraries Stories: Central City children's area redevelopment has the "wow factor"
Central City children's area redevelopment has the "wow factor"
A forest has sprouted up in the Central City Library, complete with stream and a friendly taniwha - it’s the magical new children’s area. The new children's area is located on the ground floor of Central City Library. The revamped ground-floor space was developed in direct response to the growing needs of those living in Auckland’s central city. A survey of inner city residents and children in 2013 identified the need for a clean, safe, fun and accessible kids-only space within the CBD. The Central City Library junior area redesign flowed out of this. 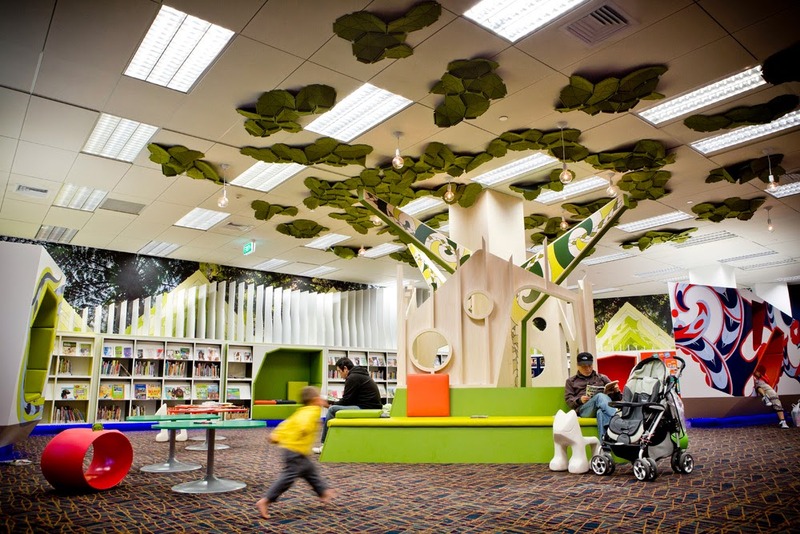 The striking and unique design includes a wooden reading tree in its centre with a hut or pā structure around it, through which children can climb and explore. A forest adorns one wall while the ceiling features a canopy of leaves. Blue twinkling lights symbolise the ancient Waihorotiu Stream, now hidden under Queen Street, while a shelving system in the shape of a friendly taniwha (that includes cushioned reading nooks) wraps around the area, creating a feeling of warmth and inclusion. The area has proven immediately popular with children of all ages - including teens and adults who are not parents - and it is not uncommon to see “big kids” enjoying it too. As well as being a great place to play and explore, the space also houses the Central City Library’s children’s collections and provides endless opportunities for hosting events and programmes. Manager Service Innovation Māori Judith Waaka-Tali says the design was a collaborative effort: Auckland Libraries partnered with architecture and interior design company Creative Spaces, members of Ngāti Whātua and artist Graeme Tipene for the project which took just six months from concept to completion. “The designs came together as a series of idea discussions over a couple of months. Once we had figured out we all wanted the same thing, it went from there and was really easy,” Judith said. The revamp is also congruent with Auckland Libraries’ 10-year plan, Te Kauroa - Future Directions, which includes in its aims to develop a quality network of library facilities reflecting local communities and pilot new types of spaces in libraries which offer learning and creative opportunities for all.